This past weekend I spent time in Florida with my Dad's family. Plenty of fun, food, and relaxation was had! My grandpa and his girlfriend recently renovated their home so I also was able to get plenty of photos of this updated Boca beauty, too! It's always the little details that catch my eye. 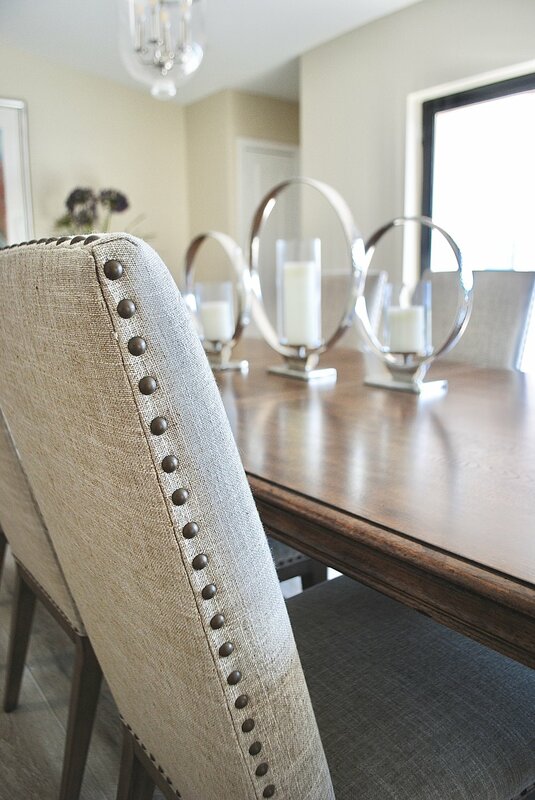 I also think it's the the same little details that bring out the best features in the room's bigger details, like the rustic studs on each of the dining room chairs. I'm such a sucker for a set table. When I was little I would draw table settings because I loved them so much. I think I was about 5 or 6 when I learned the correct side of the plate to lay the forks and spoons and knife. After that I was hooked and continued to get super excited each and any time I had a chance to set a table! This table setting was BEAUTIFUL! Everything matched perfectly with each piece complementing one another. These leather placemats are a game changer. There's a modern character that comes with them, not to mention they're much easier to wipe down and clean! I'm a very detailed person, so as you can imagine, I had such an appreciation for these napkin rings! 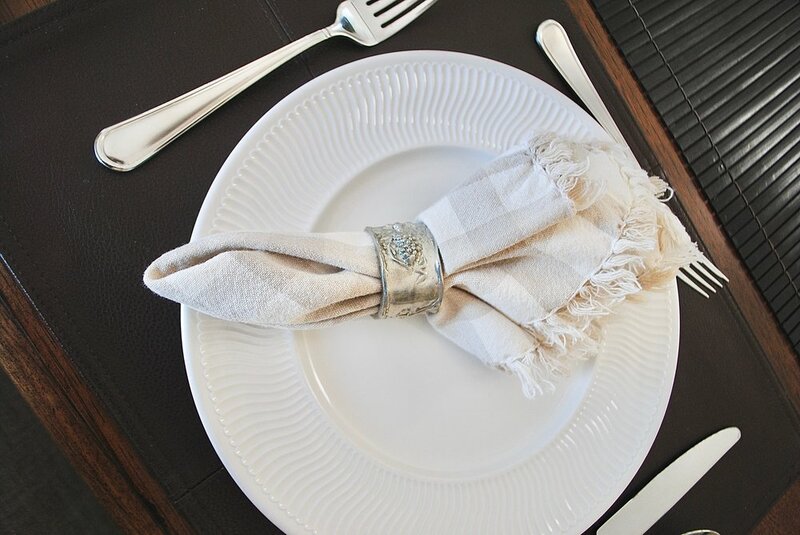 They tied together the delicateness of the cloth napkins with the table's metal accents (like the centerpieces below), enhancing the overall sleek, contemporary personality. I was immediately smitten by this entire kitchen, and headed back to NC with all the kitchen envy! It's clean features and subtle accents create this really calming feeling. I love the contrasting texture of these bar stools with the rest of the kitchen decor! It makes them stand out while still remaining tied to the rest of the kitchen's scheme. What's a brunch without a Bloody Mary bar, am I right?? And also, what's any meal without a little dessert?! No meal of mine, that's for sure. The decor in their home is basically the complete opposite of that of The Mint Cottage lol, but one thing they both have in common is the use of multiple patterns within a room. I feel like sometimes we're afraid to mix and match different patterns because we're worried they'll clash or come off too busy, but here's a great example of how you can incorporate various patterns in the same room. These two chairs have very different patterns but the colors in each are what bring them together and make them work harmoniously. 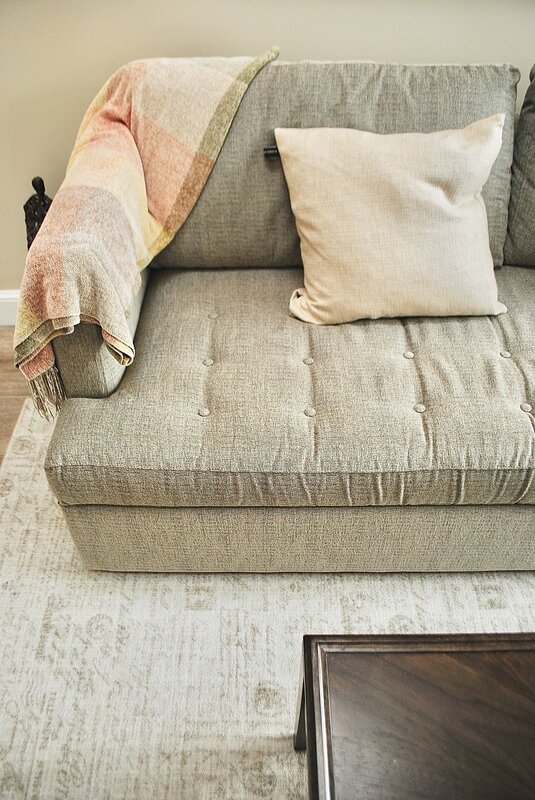 If you read my coffee table styling post, then you can probably catch a couple overlapping features. One that I'm looking forward to including in The Mint Cottage's setup from now on is the trail mix! Coffee table with a snack? Definitely sign me up. Not only are these benches super comfy (I basically tested every seat in the whole house for fun), they also act as a bridge between the formal living room and the family room. I'm having a really difficult time deciding which piece is my favorite--the sconces, this beautiful throw blanket, or the rug? Toughy, right?! It ended up raining some on Saturday, so I spent a good bit of time with my behind on this couch watching the World Cup and I'm still not over Germany's winning goal in the 94th minute against Sweden. They really thought of every detail from floor to ceiling, and the foyer is a great example of that! That's a wrap for now, but I promise to share the rest of the home on my next Boca visit! I'm already looking forward to being with these peeps again...and obviously enjoying more of this cake. :) Recipe below!